Joe Jordan Manchester Utd & Scotland signed 12x8 inch photo. Joe Jordan, Manchester Utd & Scotland, signed 12x8 inch photo. 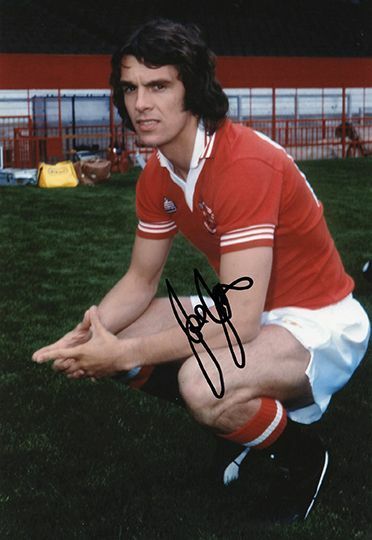 12x8 inch colour photo personally hand-signed in black sharpie pen by Joe Jordan, Manchester Utd & Scotland. Jordan was capped 52 times for Scotland from 1973-1982. He played as a striker for Leeds Utd, Manchester Utd and AC Milan. Jordan was inducted into the Scottish Football Hall of Fame in 2005. He is considered a legend among the Tartan Army, being best remembered for scoring the crucial goal against Czechoslovakia in 1973 which ensured Scotland qualified for their first World Cup finals in 16 years.